Visitors are invited to sit in armchairs or on sofas. Around them, women are speaking to someone else. The off-screen interlocutors are people close to these women, but their intimate relationships have been interrupted due to the migration of the women’s children. The women are talking to a grand-child they never got to see grow up, to a child-in-law they did not choose or approve of, to an emigrated child, or, in one case, across a gap of three generations. The intimacy fraught with a slight uneasiness is characteristic of the situation. Sometimes you hear the other voice, sometimes you don’t. The women, among whom two live in Russia, live in a great variety of countries. 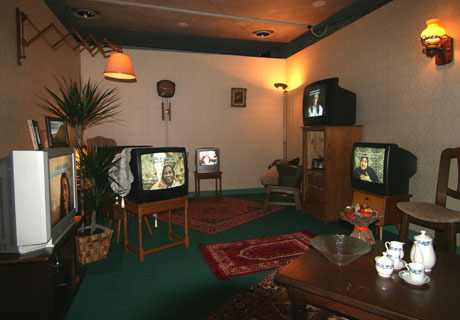 Communication unfolds between the woman and her relative, but, due to the installation set-up, also among the video portraits and between the women and the visitors, all at once. The performative aspect on all different levels brings about a merging of communications. The armchairs can be moved or turned, as if one were actually visiting the women on the screen – the visitors can concentrate their attention on one woman or alternate between several of them. The women are consistently filmed in close-up, as portraits. The relentlessly permanent image of their faces provides a modest monument to the profundity of their losses. It also forces viewers to look these women in the face, in the eyes, and listen to what they have to say. Even though their languages are foreign and full of expressions that seem strange, theirs is a discourse we can all relate to affectively. There is no narrative voice; the mothers do all the talking. Any sense of tourism is carefully avoided: while intensely visual, the films show neither monumentality nor picturesque scenery. No spectacle is offered to gratify a desire for beauty; instead, the films engage intimately with the individuals in front of the camera. All sound is diegetic. The sense of intimacy is enhanced not only by the personal subject under discussion – the departure of a child who left for Western Europe – but also by the “privacy” of the conversations. The filmmaker set the shot, switched the camera on, and left the room, only to return after the allotted time. This gesture of abandoning authority and leaving what happens to the serendipity of the interaction between two people makes the filming highly performative. The women, sitting in their own homes, speak their own languages. All videos are supra-titled. Hearing a cacophony of voices, then concentrating on one of the mothers, the visitor goes through a subliminal apprenticeship in auditive distinction.